Please cancel my next acupuncture appointment. 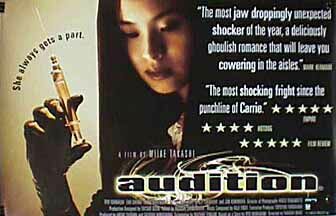 "Audition" begins as a mild drama about a widower who seeks a bride by screening women during a film making friend's casting call. What he gets is not what he expected. A clean, crisp, and highly stylized shoot, the first half of the film is pieced together one piece at a time, building curiosity more than suspense. In the denouement, however, the film breaks up and scatters, losing coherence in a sort of macabre, grisly, and frenetic montage. For many that will serve as a more than adequate dose of horror. For others, it will cheapen the result for there is no terror greater than that which can be perceived as real. It is difficult to have realistic perceptions when looking through a kaleidoscope of gruesome imagery. Horrific stuff for horror film buffs.